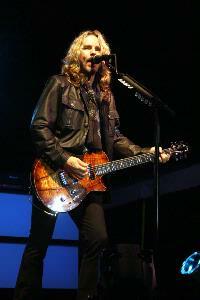 At one point during Styx’ show at Rockford Illinois’ On The Waterfront Festival’s kick off concert, Tommy Shaw asked those in attendance who among us were at our first Styx concert. My hand went up. After this concert I can sincerely say that it won’t be my last Styx concert – at least if I can help it. 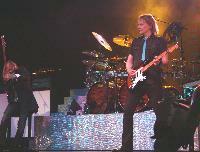 I wish I could say that I was too young to see Styx in their glory years. That wouldn’t be true, though. I was one of those snobs who thought that anything that was popular had to be bad. So, even though I had countless Styx albums I refused to go see them in concert. Well, if they were as good then as they are now – that’s my loss. The group tore through hits from various portions of their career. They were tight without making it feel like you were listening to their CD. That’s always important. If someone is at a live show it should feel like a live show. Anyone can pop the disc in at home any time they want. What they can’t do is see a band live any time they want. It should be a one of a kind experience – a shared happening between musicians and audience – and it was. 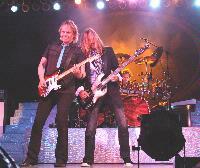 One of the things that is apparent when you see Styx live – right off the bat – is that this is a team effort. 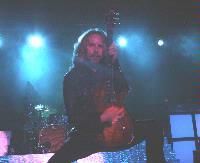 Some groups feel more like a showcase for one or more members of the band. 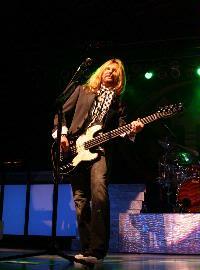 Styx’ show is not like that at all. Instead it seems like a powerhouse live rock excursion that has nearly equal contributions from all involved. The multiple layers of vocals and varying lead vocal performances are one example of this. Perhaps less obvious at first is the fact that Styx seem to think of the audience as another equal member in this equation. You really get the feeling that these guys feed off of the audience. You can also tell that they really love doing what they are doing. 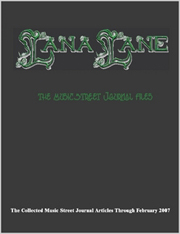 Being so close to Chicago – the band was originally formed in the Windy City, allowed for us to get a special treat. Founding member Chuck Panozzo joined the band onstage for a probably half of the show. This was a cool touch and something I’m guessing doesn’t happen all that often. I believe Panozzo still lives in Chicago and that made it a convenient show to make. I suppose you can’t review the modern Styx without mentioning another notable alumni. 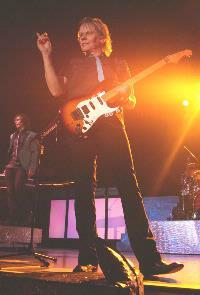 Dennis DeYoung was a big part of the classic era of the group – and his absence might have a few people feeling a bit of trepidation at seeing the band. Well, there is no reason to fear. Larry Gowan fills his shoes admirably. I have to say that while I respect DeYoung greatly and appreciate his contribution to the history of the band, I found myself thinking “Dennis who?” during this set. Say what you will, but as a music journalist I see a lot of live shows. This concert was among the best I’ve ever seen – and that’s no joke. When you consider that they played without any real stage tricks or gimmicks that’s even more impressive. 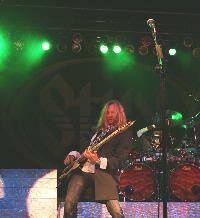 If you haven’t seen Styx get out and see them. If you haven’t seem them in a while – again, stop waiting. 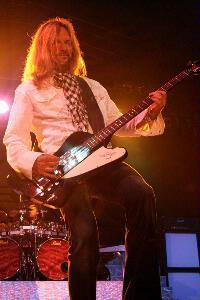 The current line up is the aforementioned Shaw and Gowan, James (JY) Young, Ricky Phillips and Todd Sucherman. 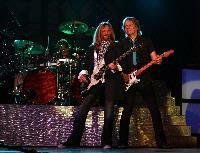 That’s a lineup that definitely doesn’t leave the audience wanting – unless it’s for another hour of Styx.